"For 'Cleave', we played to our strengths; catchy songs, catchy choruses, catchy riffs, and really good drum beats." - Andy Cairns. Hi Andy, how are you today? I’m good, I’m really good, thanks very much. I have to firstly talk about your new haircut; that’s quite a do you’re sporting in the band’s most recent press pictures. You’re here at Ramblin’ Man Fair today; how’s it been? This is brilliant, actually. I mean, I’d been tipped off by a friend of mine – Ricky Warwick, he played it last year, and the year before with Thin Lizzy and Black Star Riders respectively - and I told him we were asked to do it, and he said; “Mate, you’ll love it. Go and do it”, so I’m glad. It was great. 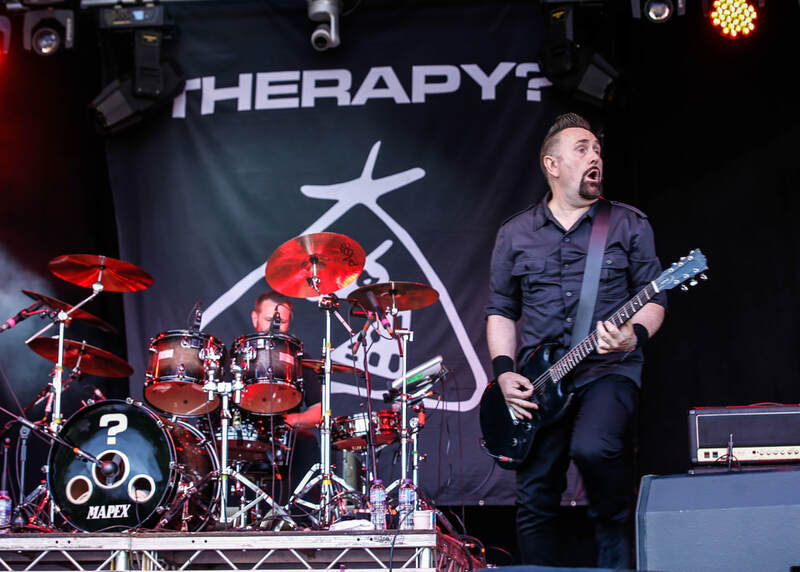 RMF is more of a classic rock festival, and Therapy? straddle genres; are the band at a stage where it doesn’t matter what sort of festival you’re playing at? I think it’s because think because we’re so enthusiastic. No one’s going to look at me and go; “He’s busting out some serious chops there; that vibrato is exceptional, that tone is exquisite!” People are going to go; “He’s riffing and shouting, but it looks like he’s having the time of his life”, and I think maybe that’s infectious. We can all play, and we all have fun on stage. 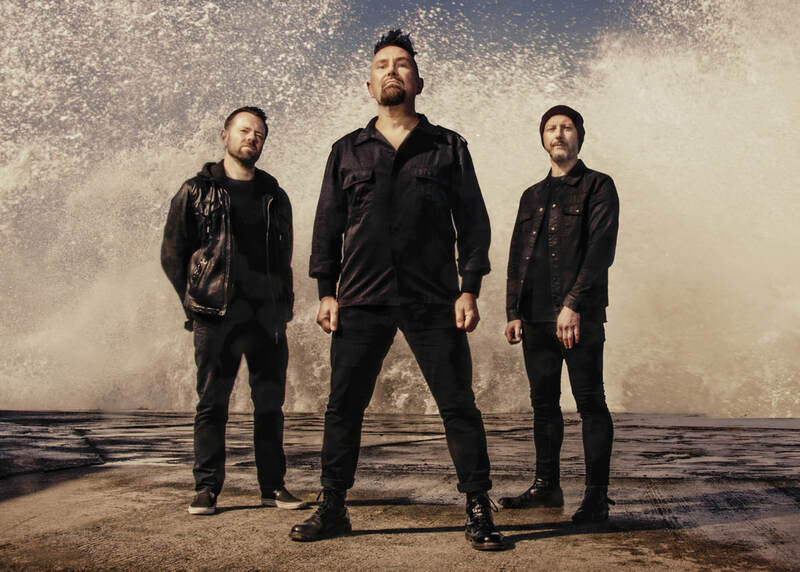 We go play a punk festival and we might not look like Green Day but we have fun on stage; we do an Indie festival, and people see there’s enough invention in the music for them to get into that. Clearly, you’ve also got the songs, and having a million-selling album like ‘Troublegum’ can’t do any harm. It’s one of those albums that keeps getting us new fans. Any time we meet younger fans, chances are they’ve heard a track, or they’ve hear band covering a track from it. It keeps on getting people into us, so we’re really grateful about that. You’ve done a lot of albums since then, but you’ve clearly an arsenal of singles from that particular release that people love. It’s brilliant. Off ‘Troublegum’ there was five or six hit singles, and ‘Isolation’ wasn’t as single here, but it was hit single in Germany, where we released it. But it’s good, and I always go by what Lemmy said years ago. Somebody said to Lemmy; “Do you ever get tired of playing ‘Ace Of Spades’?” and he went; “No”, he said; “It would be worse if I’d never written that song”, and it’s true; the whole ‘Troublegum’ thing basically turned us from basically playing to fifty people in a club to playing here at Ramblin’ Man today. Therapy? At Ramblin' Man Fair 2018. Photo: Darren McVeigh MetalPlanet Music. You opened with ‘Isolation’ today, as you did back in 1995 when you played at Castle Donington; that seemed like a bold move then, given it was very much a metal festival at the time. 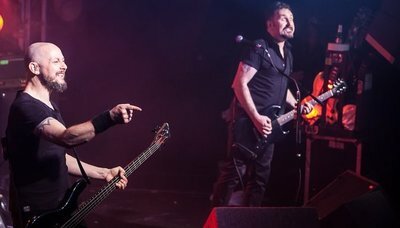 Retrospectively, we’ve had a couple of chats with metal and rock journalists over the years that we’ve gotten to know, and we always come back onto the same thing where, when we opened for Metallica with short hair and a Joy Division cover with electric cello on stage, that was outrageous – no one had ever done that. You go to Download now, there’s loads of bands with short hair, loads of bands with decks and other instruments on the stage, but just then ’93 / ’94 / ’95, you were still taking your life in your own hands doing stuff like that. It was a really high profile slot, and Therapy? were second only to Metallica on that bill. I tell you what the most exciting thing about that was; me and Michael [McKeegan, bassist] were in Paris doing press for a French tour we had, and we got a call from our manager going; “Castle Donington next year, Metallica are headlining; Lars likes ‘Troublegum’ and they want to put you on, but he’s never met you. Lars is in town tonight because Slash’s Snakepit are playing and he’s going to be at the gig; do you want to go and meet Lars?” And me and Michael are going; [*Disbelievingly*] “Do we want to meet Lars? !” So, the record company got us in a cab, and we got into the gig, and backstage at Slash’s gig Lars had his own dressing room, even though he wasn’t playing. So we go ‘summoned’ to an audience with Lars, and we chatted with him and we had a couple of beers, and watched a bit of Slash from the balcony. Then we were granted permission to leave, and then the next day our manager said; “You must have made a good impression, because Metallica want you to go on just before them”. To play that show in that slot must have been quite unbelievable. Well, the one that got me was, I was wearing a pair of black leather shoes that I’d bought in London, and Kirk Hammett came up to me and went; [*adapts Californian accent*] “Hey man, where did you get those shoes, they’re really nice”! And I had to write down the address of the shop I’d got them in, in London. He was really impressed! I thought come over and go; “Hey man, what about that SG?”, and talk about pentatonic scales and playing really fast, and he went; “Where did you get your shoes?” [*Laughing*]. That show pre-dated the ‘Load’-ear for Metallica; does that mean that you were responsible for the band’s image change?! No one’s ever noticed, but we used a photographer called Anton Corbijn for ‘Infernal Love’. He took a picture of us with frilly shirts, in black and white, wearing kind of ostentatious clothing, and a few years later, Metallica use Anton Corbijn, and have photographs taken in ostentatious clothing. Moving on, and album #15 ‘Cleave’ is due for release; how is it sounding? It’s turned out a million times better than we thought it would. I mean, we’ve got [producer] Chris Sheldon that did ‘Troublegum’ and ‘Semi-Detached’ on board. We played to our strengths; catchy songs, catchy choruses, catchy riffs, and really good drum beats. There’s ten songs, they’ve all got a relationship to each other. The album sounds like ‘Troublegum’ meets ‘Nurse’ but made for the 21st century. The lyrics are all about current issues. ‘Cleave’ itself means to prise apart or to pull together – it’s two different things. We’re really over the moon about it. The other good thing about it is we’ve recently signed a worldwide deal with Marshall Records, so it comes out all over the world, everywhere, which is a big deal for us. Our last few records only came out in Europe and Canada, and it’s a big deal for us to have a record available to everybody. I mean, I know it’s different now with downloads and all, but to have a presence, and a distribution centre everywhere is great. What’s it like to be on an imprint like Marshall Records? Marshall have been great so far. Also, I’d be a liar if I didn’t say it’s fantastic to get free amps. I was down that factory like a rat up a pipe, I tell you, when we signed that deal. I didn’t need to be invited twice. During today’s set, you dedicated ‘Die Laughing’ to Vinnie Paul. I must admit, part of me was shocked [to hear of his passing], and then I’d imagine that he maybe had a lot of health issues that nobody knew about. It was a shock. There always seems to be somebody else, and there was that bad year a few years ago when Lemmy, Prince, David Bowie and all died. But then again, I was thinking the other day, one my favourite bands of all time is The Ramones, and they’re all dead. It’s just life, really. 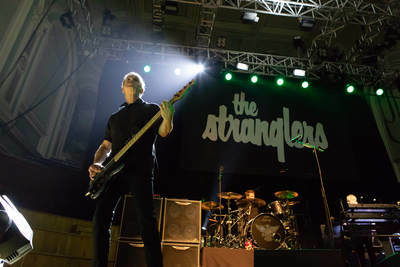 You played at the Ulster Hall as guests to The Strangles earlier this year; was it nice to be back in that venue after first headlining it in 1995? It was. That gig itself [in 1995], the night was amazing. We had Ricky Warwick joined us on stage, Skin from Skunk Anansie joined us on stage, Ash, Joyrider were on the bill, and then we stayed in the Europa [hotel, Belfast] that night, and The Prodigy stayed there. After their gig we were drinking with The Prodigy, and the biggest moment was, we were sitting there with The Prodigy, and Skin, and Ash, and Joyrider and Ricky Warwick, and Rod Hull had been doing a panto at the Opera House, and he came into the Europa bar, and all these bands; Prodigy, Joyrider, Therapy? all stopped and went; “There’s Rod Hull!”, and he was more swamped for autographs than anybody in any of the bands. The album’s coming out on 21st September. We’ve got a British tour in October, we’ve got a European tour in November, a few gigs in December. We’re doing an Irish tour either January or February - we’re trying to do eight gigs; it’s a bit in the pipeline. And then we’re going over to Austria, Switzerland and Italy, and then probably back to Belgium and Holland. We intend to tour ‘Cleave’ at least until next Easter, but we might be going back to the States too, so if that’s the case, it’ll be after Easter. Is it nice to have fresh material to add to the set? Well, the good thing about the new album is it sits very nicely with the ‘Troublegum’ and ‘Disquiet’ stuff, so you know, we could make a set out of ‘Troublegum’, ‘Disquiet’ and ‘Cleave’, and it’ll make for a really, really fantastic set list. Therapy? release 'Cleave' on 21st September, via Marshall Records. For all things Therapy? visit the band's official website. 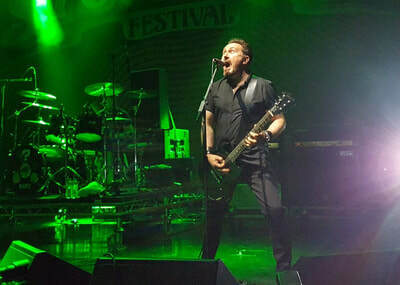 INTERVIEW: Andy Cairns Talks Guitar Solos & More From Stone Free 2016. Therapy? Claim Northern Ireland Music Prize in Belfast.